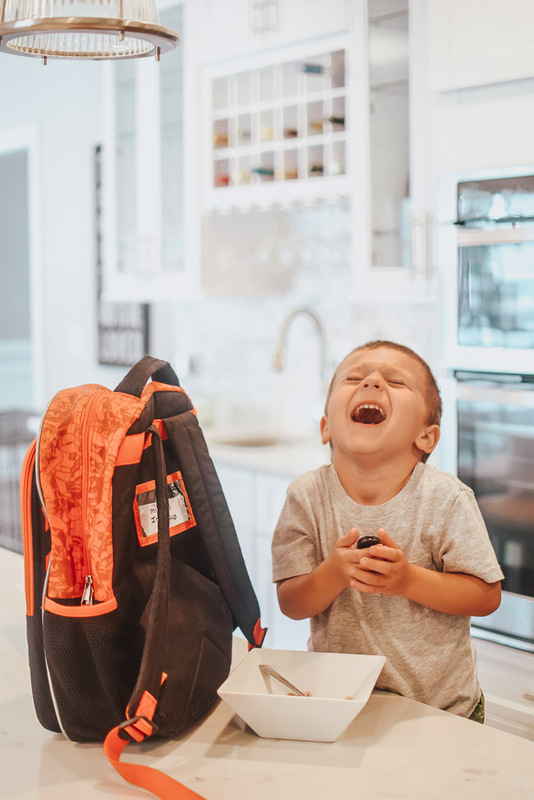 *This “Back-To-School Routine With Renew Life®” post has been sponsored by Renew Life. All thoughts and opinions are my own. One thing I have to admit is that I’ve been really anxious about getting into a back-to-school routine after baby no. 3 gets here. When the kids head to their first day of school, our new babe will only be (roughly) 3 weeks old. YIKES. Since my husband leaves for work before the kids are even up for school, I do the morning gig by myself…. every. single. day. Maybe it wouldn’t be so bad if the kids didn’t have to be AT SCHOOL by 8:15, but they do. And it’s tough. 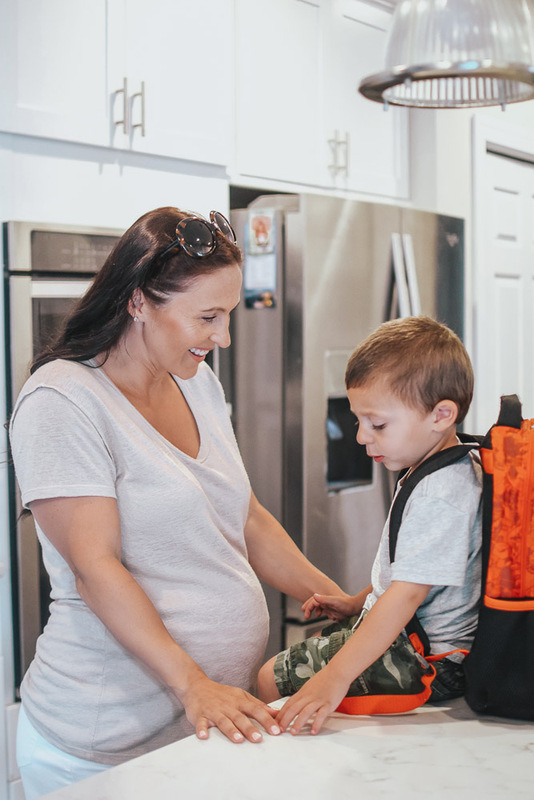 Now that I’ll have a newborn when they start school this year, I’m definitely feeling worried about getting them to school on time every day (without scrambling of course – isn’t that the dream?!). So I’m starting to prep myself NOW for what our new back- to- school routine will be like come September. I think it’s not only important to have a great routine for the kids but also for yourself as well! 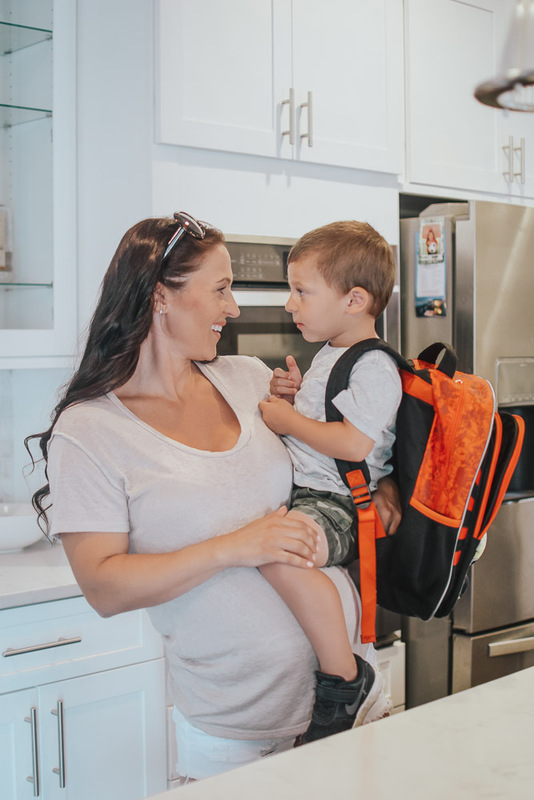 I personally feel best (aka less frazzled) when I stick to a routine for them AND for me, so today I’m sharing some simple ways I plan to stay sane and power through my morning with 3 littles once the school year begins. Set a wake-up time. This is always a struggle for us because our kids have been giving us a REALLY hard time going to bed at night…. which of course leads to tired kids every morning. But getting up at the same time every day is a great way to know that you have plenty of time to get everything done that you need to before leaving the house. Gradually adjust bed time as the school year approaches. If your kids have been staying up late every night all summer, it’s probably going to be a major adjustment going to bed early. Each night, try getting them to bed 15-30 minutes earlier to start prepping for the new schedule. This will help with tip #1! Have daily vitamins/probiotics out on the counter. 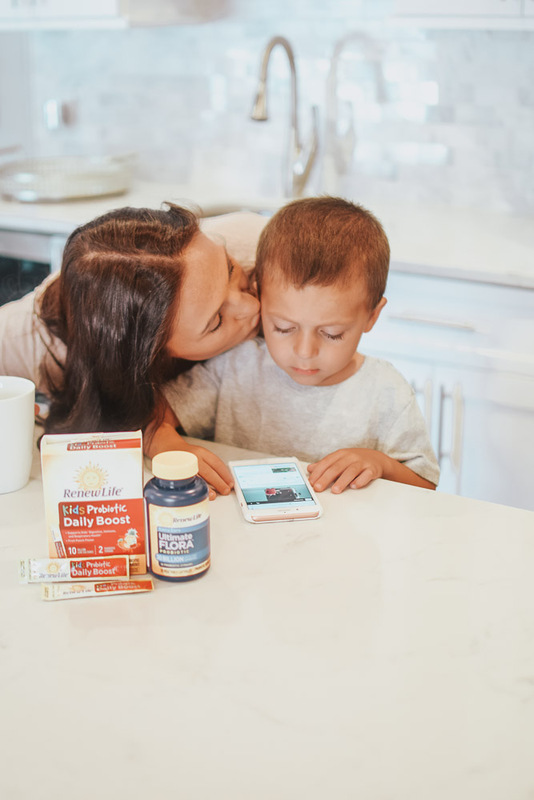 If your kids take vitamins/probiotics every day, save yourself some time by having them ready the night before. 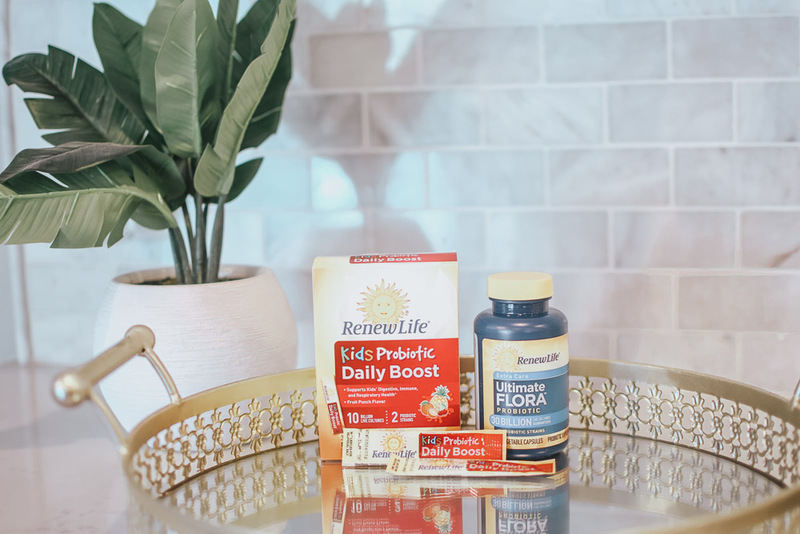 We personally enjoy Renew Life® Kids Daily Boost Probiotic because it supports digestion and they’re dairy/gluten free. 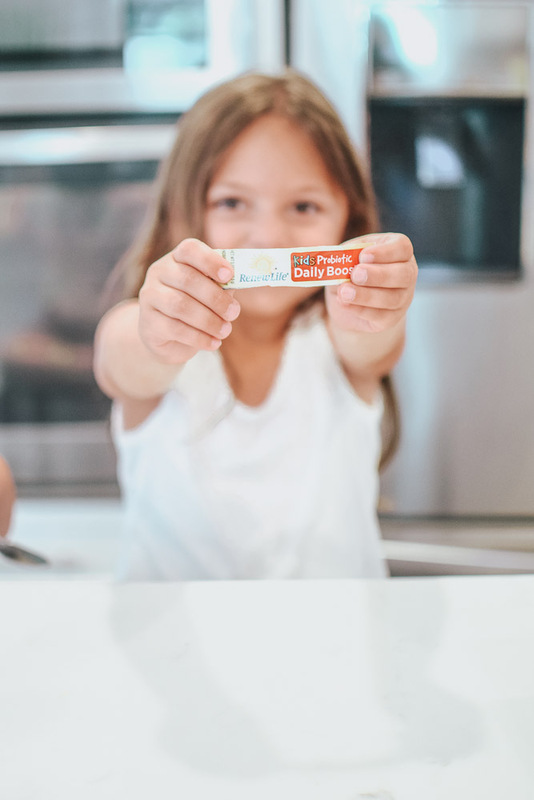 Our kids love the fruit punch flavor, and it helps keep their gut healthy so they can power through long school days and after- school activities. Right now, you can save 15% at RenewLife.com with promo code “Back2School”. 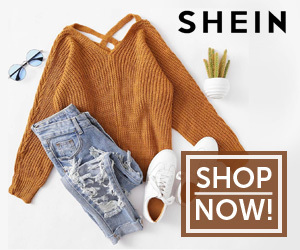 I’ve recently been shopping straight from their site because the shipping is super fast and they offer free shipping on every order over $49 so I just stock up for myself and the kids! Lay out clothes the night before. Having the kids’ clothes (and heck, do yours’, too!) laid out the night before school saves a boat load of time every morning. If you have a headstrong little one who is adamant about picking out their clothes (I’m raising my hand big time over here), this can be even more of a time (life) saver. Have your breakfast planned. 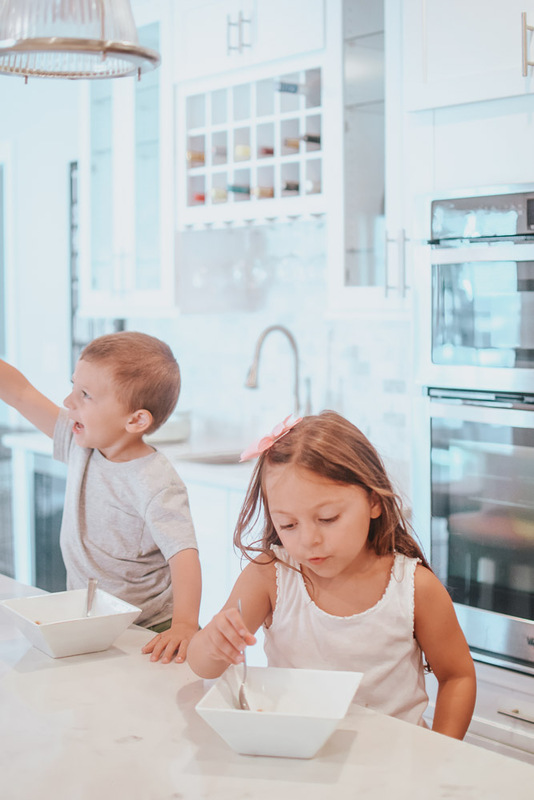 Ask the kids the night before what they want for breakfast in the morning. Will they change their mind in the morning? Possibly. But it’s worth a shot to ask and just remind them in the morning. There is nothing worse than having to make bacon and eggs 10 minutes before you’re set to head out the door. Prepare lunches the night before. Of course, this depends what they’re eating. However, preparing as much as you can will definitely save a nice chunk of time. Sure, we need to get our kids into a good back-to-school routine, but we also need to do so for ourselves, too. If you’ve been reading this blog for awhile, you know that we live a healthy lifestyle. From the food we eat to the vitamins we take and the way we exercise our bodies, health is always at the forefront. As parents, I think we all tend to get wrapped up in caring for our kids and often forget to take care of ourselves! Here are a few simple tips to help keep you on track so you, too, can have a great year ahead! Give yourself a bed-time. Sleep is just as important for adults as it is for kids. Aim to get 8-10 hours a night, and make it a priority to turn off electronics at least an hour before you lay down. Set out your clothes the night before. Luckily, my mornings consist of workout clothes, so I don’t have much to prep. However, if you know you’ll need a shirt ironed or a dress steamed, have it done the night before to save yourself some time in the morning. Prep vitamins/probiotics the night before. Over the last 9 months, that’s been a pre-natal vitamin for me. 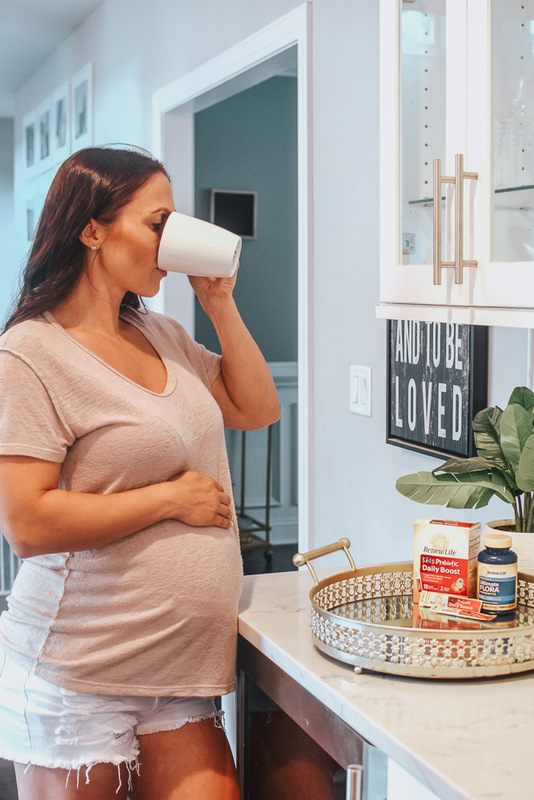 But now that baby is due to arrive any day, I’ll be back to my daily vitamins and Renew Life Ultimate Flora Extra Care Probiotic. I personally try to steer clear of dairy, so these are perfect for me because they’re dairy (and gluten) free. Also, with a healthy gut I am keeping my energy up and my focus sharp, which is so needed these days! Don’t forget you can save 15% at RenewLife.com with promo code “Back2School”. And a little FYI for those of you who feel stressed often (don’t we all?!) Renew Life Products lead to a healthy gut, and a healthy gut helps to reduce stress while increasing energy levels. Score! Give yourself an extra 5-10 minutes to pack your bag. Is your purse a bottomless pit? Good, mine too. I find that I’m always rushing at the last minute because I forgot to fill my water bottle, can’t find my keys, or don’t know if I have my sunglasses or not. Give yourself the extra few minutes each morning for these simple things you know you’re going to need before leaving for the day. Meal prep at the beginning of the week. I know, it seems like a LOT of work. But honestly, it’s one of the best ways to make getting out of the house that much easier. Not to mention, preparing your lunches makes it a lot less likely that you’ll stop for fast food when you’re on the go. Meal prepping is one of my BIGGEST tips for my clients because you simply CANNOT out-train a poor diet. You can see some of my fitness posts here. 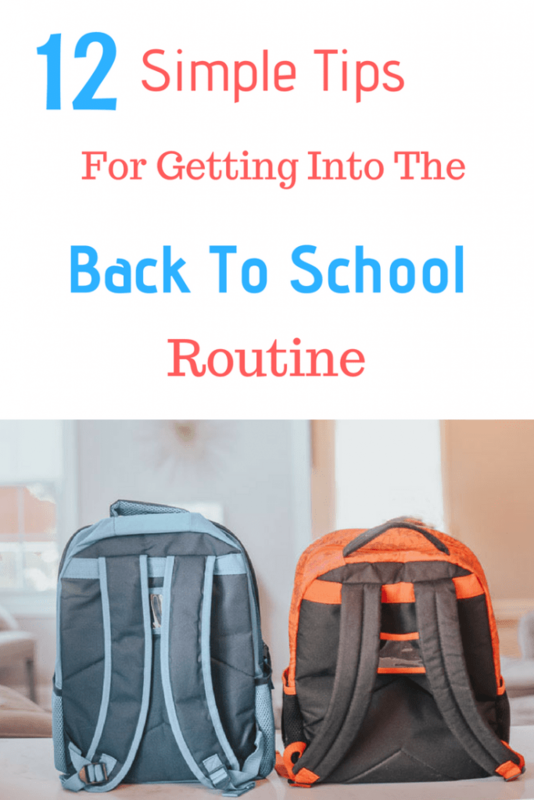 These are my simple tips for getting into a back-to-school routine for both you AND the kids! Do you have any back-to-school tips you swear by? I want to hear them! Share this “Back-To-School Routine With Renew Life” post on Pinterest via the image below! These are great tips! I can’t wait for my oldest to start back up at school in a couple of weeks! Probiotics are SO SO SO important!!! Everyone needs to be taking them- for sure! I totally agree! I’m so glad our kiddos take them so willingly! Sounds like you have your morning routine down! I’ll have to check out these probiotics, sounds like its a great addition to your day. We do! Thankfully!!! G loves these probiotics because she can sprinkle them into her mouth herself LMAO! Oh mama! This sounds rough. My preschooler is starting in a few weeks and I can’t imsgune doing that morning routine with a newborn! You’re gonna do great though. Somehow we always get through the tough times! It’s true… we always get through it. But I am definitely anxious about it haha!! It’s so hard to get back into a routine! Totally!! I love a good schedule though! ha! This is my first school year and I’ve definitely been doing the ‘night before’ meal prep. It’s helped tremendously. Thanks Eryka! I’m glad you think so!